Being social is something many of us take for granted. At one time or another we’ve probably looked at someone and thought ‘I know exactly what you’re thinking’. When doing this we are processing many types of visual, auditory and other information, allowing us to interpret another’s behaviour and infer what they may be thinking and feeling. It is also more than likely that we have got this completely wrong at some point, misreading someone’s intentions and possibly creating a fairly awkward situation we’d rather not be in! Now try to imagine what it would feel like if you always found it difficult to read the behaviour of others, to not understand what they may be thinking or feeling. What sort of impact would this have on your life? In 1943 Leo Kanner made his first account of individuals with a profound lack of affective contact with other people, they were unable to ‘understand’ others. He diagnosed what he saw as early infantile autism, a diagnostic label that is now known as autism. One year after Kanner’s observations Hans Asperger conducted observations on a similar (but higher functioning) group of individuals, identifying a condition known today as Asperger’s Syndrome. These are two examples of what is generally considered to be a number of conditions on an autistic spectrum. This article will provide the reader with an insight into autism with particular reference to the conditions of High Functioning Autism (HFA) and Asperger Syndrome (AS). One of the most striking characteristics of people diagnosed with autism is their impaired ability to socially interact with others, which affects almost every aspect of their daily lives (Howlin, 1998; Zager, 1999). Those with a diagnosis of HFA or AS can have difficulty in naming the facial expression of others (Grossman et al., 2000) and defining emotions, particularly complex emotions such as pride or embarrassment (Capps et al., 1992). A child diagnosed with HFA or AS may also describe events in terms of actions, not feelings, and may display their own emotions in a way that is seen as socially unacceptable, for example, hugging a total stranger. Studies have found that that those with a diagnosis of autism are more flat/neutral in their expressions of emotion (Yirmiya et al., 1989) and express less positive emotion (David & Tager-Flusberg, 1997). When comparing those diagnosed with Autism with those diagnosed with Down’s Syndrome, Loveland et al. (1994) found the participants diagnosed with Autism produced fewer recognizable facial expressions than participants with Down’s Syndrome. This impaired ability to interact with others is often explained using the theory of mind hypothesis (often abbreviated as TOM). Although this concept is difficult to define it is seen as the innate ability that allows us to recognise that another’s mental state is different from our own. Failure of false belief tasks such as the ‘Sally Anne’ test (i.e. a response along the lines of “Sally will look in the box”) are believed to indicate an absence of theory of mind and, after the age of 4/5, can be taken as an indication of autism. For a full account of how this task can be used when investigating autism see Baron-Cohen et al. (1985). The theory of mind hypothesis suggests that impairments common in those with a diagnosis of autism can be explained in terms of failure to attribute mental states to the self and others. To put it another way, those with a diagnosis of autism are, to varying extents, ‘mind-blind’. The difficulties experienced by those diagnosed with autism are usually categorised into three areas: socialisation, communication and flexibility of thought, and are known as the triad of impairment. Figure 1: The Emotional Processing Model. 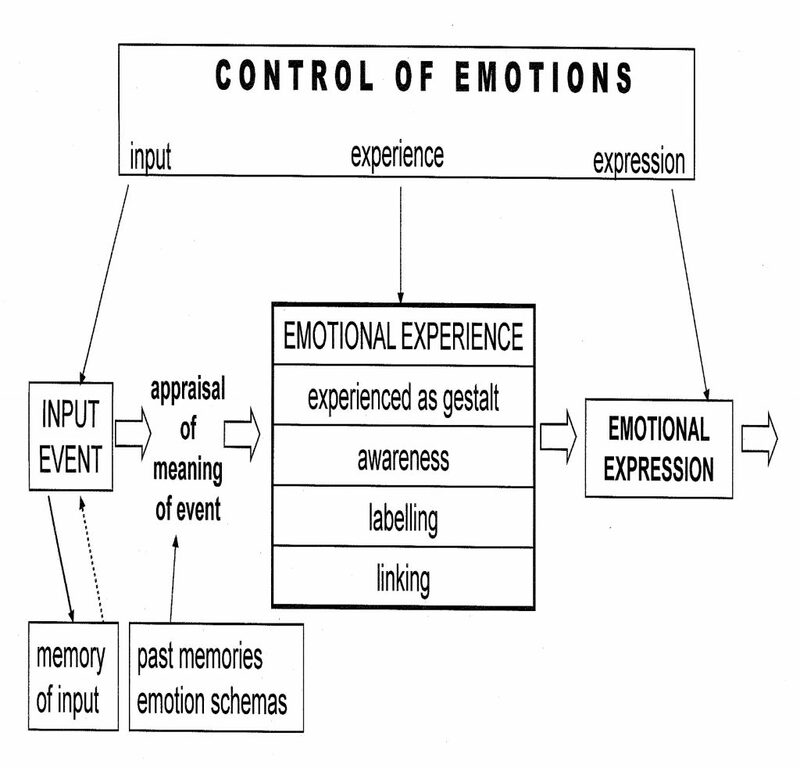 Figure one represents the model of emotional processing proposed by Roger Baker (Baker, 2001). The difficulties in socialisation, communication and flexibility of thought experienced by those diagnosed as having an autistic spectrum disorder have the potential to have a great impact on the individual’s control of their emotions. Poor understanding of facial expression (Grossman et. al., 2000) and complex emotions (Capps et. al., 1992) may lead to inaccurate appraisal of a given event, for example, seeing a stranger’s approach to shake hands as some kind of threat. In addition, the triad of impairment may also impact of the individual’s emotional experience i.e. being unaware that he/she is in a situation where the norm would be to reach forward and shake the stranger’s hand, and/or incorrectly labelling the sensations he/she is feeling regarding the given situation. These disruptions between input event and emotion experience can lead to the individual expressing emotion and behaviour unexpected or inappropriate for the given event, such as ignoring the outstretched hand or moving away from the person wishing to shake hands. In essence, there are obstacles to many of the elements presented in Baker’s model of emotional processing which may impact on the individual’s ability to understand and control their emotions. Investigation into the neurological aspects of emotions and emotional experience has thrown further light on autism and what it is to be social. A neural basis of social intelligence was first suggested by Brothers (1990) who proposed that the amygdala, orbito-frontal cortex and superior temporal gyrus constituted the social brain. This follows the idea that social intelligence may be modular and separate from general intelligence. More specifically, the amygdala has been found to be an area of the brain that is active during emotional processing (Ketter et al., 1996; Morris et al., 1996), with damage in this area leading to impaired judgement of emotion (Calder et al., 1996). Further support for the amygdala theory comes from a study by Simon Baron-Cohen (1999). In a fMRI study 6 participants diagnosed as having autism were presented with two tasks, the first required the participants to indicate whether the photographs shown to them were male or female, the second required the participants to indicate which of two simultaneously presented words best described the mental state of the photographed person. The study found that the autism group appeared to not activate the amygdala during the social task but placed a greater processing load on the temporal lobe structures, specialised for verbally labelling complex visual stimuli and processing faces and eyes. Baron-Cohen suggested those in the autism group may be solving the task using language and facial memory functions to compensate for an amygdala impairment. He also suggested that individuals diagnosed with autism may have a general deficit in emotional processing. The interest of emotion and the brain mechanisms that underpin it have become the interest of many researchers, after a time of seeming neglect. Work by researchers such as LeDoux [see LeDoux (2000) for a detailed review of emotion and the amygdala] have also highlighted the importance of the amygdala when examining emotion, with particular relevance to fear conditioning. In the child’s attempts to ‘block-out’ the onslaught of the environment he/she will be deprived of the very experiences that are vital for healthy development. Later in the child’s development, what looks like a deficit in mind-reading may be a result of the child’s lack of emotional interactions. The child’s early sensory challenges have disrupted social and personal development. In essence, affective interaction is needed for the child’s emotional development. Satoshi Beppu also argues that a greater understanding, other then the Theory of Mind hypothesis, is needed. 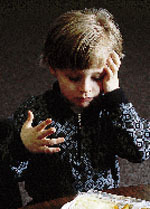 In two longitudinal naturalistic case studies of children with severe autism Beppu (2005) highlighted the importance of attachment relationships in those experiencing the difficulties associated with autism at infancy: that there is a link between understanding the minds of others and attachment. Attachment in children is often assessed using the Strange Situation developed by Mary Ainsworth and colleagues (1978); where the child’s attachment behaviour can be observed between the ages of 12 and 21 months. In a laboratory playroom the child is confronted with a stranger and two short separations from the caregiver (once with and once without the stranger present). The child’s behaviour upon reunion with the caregiver is rated on proximity seeking, contact maintaining, avoidance and resistance. On the basis of these, the child is assigned an attachment classification. In a meta-analytic review of the literature Rutgers et al. (2004) also highlighted the importance of attachment in pervasive developmental disorders such as autism. Rutgers suggested that although pervasive developmental disorders may alter the behavioural patterns that express attachment security (Rogers et al., 1993) they do not seem to preclude the development of secure attachment relationships. Therefore, the difficulties experienced by those diagnosed as having autism (i.e. social iteration) may make it difficult for secure attachments to be established with caregivers, but this does not mean they are not possible. It is important to note that all is not lost, several strategies have been developed over the years to help the individual diagnosed as having HFA or AS better understand the social world around them. Teaching strategies such as keeping lessons visual, concrete and in routine have been found to be beneficial and can be used alongside computer programmes (for an example see Simon Baron-Cohen’s ‘Mind Reading’) which help the individual learn about what emotions look and sound like. Incorporating strategies such as these can help those diagnosed as having high functioning autism or asperger syndrome go on to live healthy and productive lives, sometimes using their area of interest to excel in a their careers. In the case of AS, incorporating teaching strategies such as those listed above have allowed many adolescents diagnosed as having AS stay within the mainstream teaching system. Criticisms of the theory of mind hypothesis, and current research highlighting the importance of affective interaction and attachment to the developing child suggest that it is important to consider alternatives when attempting to understand autism. The emotional abilities of those with a diagnosis of autism it therefore open to further investigation. It would be interesting to investigate whether the deficits in emotional processing represent general deficits (as suggested by Baron-Chen) or whether the emotional processing styles of those with a diagnosis of autism differ in specific ways. This would help to improve the understanding of the emotional deficits seen in autistic spectrum disorders and inform future practice. Ainsworth, M. D. S., Blehar, M. C., Waters, E., & Wall, S. (1978) ‘Patterns of Attachent’ HIlladale, NJ: Erlbaum. Atwood, T. (1998) ‘Asperger’s Syndrome’, Jessica Kingsley publishers, 116 Pentonville Road, London. Baker, R. (2001) An emotional processing model for counselling and psychotherapy: a way forward? Counselling in Practice 7: 8 – 11. Baron-Cohen, S., Ring, H. A., Wheelwright, S., Bullmore, E. T., Brammer, M. J., Simmons, A. & Williams, S. C. R. (1999) ‘Social intelligence in the normal and autistic brain: An fMRI study’ European Journal of Neuroscience 11: 1891-1898. Baron-Cohen, S., Leslie, A. M. & Frith, U. (1985) ‘Does the autistic child have a “theory of mind”?’, Cognition 21, 37-46. Beppu, S. (2005) ‘Social cognitive development of autistic children’. Applied Developmental Psychology: Theory, Practice, and Research from Japan 199-221. Brothers, L. (1990) ‘The social brain: a project for interpreting primate behaviour and neurophysiology in a new domain’, Concepts in Neuroscience 1: 27:51. Calder, A. J., Young, A. W., Rowland, D., Perrett, D. I., Hodges, J. R. & Etcoff, N. L. (1996) ‘Facial recognition after bilateral amygdala damage: Differentially severe impairment of fear’, Journal of Cognitive Neuropsychology 13: 699-745. Capps, L., Yirmiya, N. & Sigman, M. (1992) ‘Understanding of simple and complex emotions in non-retarded children with autism’, Journal of Child Psychology and Psychiatry 33, 7: 1169-1182. David, R.M., & Tager-Flusberg, H. (1997) ‘An investigation of attention and affect in children with autism and Down Syndrome’, Journal of Autism and Developmental Disorders 27: 385-96. Grossman, J.B., Klin, A., Carter, A.S. & Volkmar, V.F. (2000) ‘Verbal bias in recognition of facial emotions in children with Asperger Syndrome’, Journal of Child Psychology and Psychiatry 41: 369-79. Howlin, P. (1998) ‘Practitioner Review: Psychological and educational treatments for autism’, Journal of Child Psychology and Psychiatry 39: 307-22. Loveland, K., Tunali-Kotoski, B. & Pearson, D. (1994) ‘Imitation and expression of facial affect in autism’, Development and Psychopathology 6, 3: 433-44. Ketter, T., Andreason, P., George, M., Lee, C., Gill, D., Parekh, P., Willis, M., Herscovitch, P. & Post, R. (1996) ‘Anterior paralimbic mediation of procaine induced emotional and psychosensory experience’, Archives of General Psychiatry 53: 59-69. Morris, J., Frith, C., Perrett, D., Rowland, D., Young, A., Calder, A. & Dolan, R. (1996) ‘A differential neural response in the human amygdala to fearful and happy facial expressions’, Nature 383, 812-815. Rogers, S. J., Ozonoff, S., & Maslin-Cole, C. (1993) ‘Developmental aspects of attachment behaviour in young children with pervasive developmental disorders. Journal of the American Academy of Child and Adolescent Psychiatry, 32: 1274-1282. Rutgers, A. H., Bakermans-Kranenburg, M. J., van Ijzendoorn M. H., & van Berckelaer-Onnes, I. A (2004) ‘Autism and attachment: a meta analytic review’ Journal of Child Psychology and Psychiatry 45:6, 1123-1134. Shanker, S. G. (2004) ‘Autism and the dynamic developmental model of emotions’ Philosophy, Psychiatry & Psychology 11, 3: 219-233. Wimmer, H. & Perner, J. (1983) ‘Beliefs about beliefs: Representation and constraining function of wrong beliefs in children’s understanding of deception’, Cognition 13, 1: 103-128. Zager, D. (1999) Autism: Identification, Education, and Treatment, 2nd edn. New York: Erlbaum.